Video: Watch the instructional video related to How to create a New Camera Model: here. Access via the New Project wizard: When creating a new project, the Image Properties window appears after loading the images. Important: The Current EXIF field displays the EXIF ID for which the camera model will be edited. Warning: When changing the camera parameters in Edit Camera Model, the focal length and sensor size ratio should be correct. Use the real focal length and sensor size of the camera. To find the real sensor size, ask the camera manufacturer or search here. Note: If a different camera model than the one that was first assigned to the camera is chosen, a pop-up appears asking if you want to assign by default the currently selected camera model to the cameras with the same EXIF ID. 1. On the section Camera Model, click the Camera Model Name drop-down list. 2. Use the right scroll bar to navigate among the different camera models available and click the desired camera model. Note: Only the camera models with the same resolution as the one detected for the camera are available. Refers to camera models existing in the software internal camera model database. Refers to a camera model existing in the user camera model database. Refers to a camera model existing in the software internal camera model database that has been edited by the user. Refers to a camera model whose parameters have been retrieved from the EXIF data. Refers to a camera model taken from a project file. 3. On the section Camera Model Parameters, check the camera internal parameters set up for the selected camera. 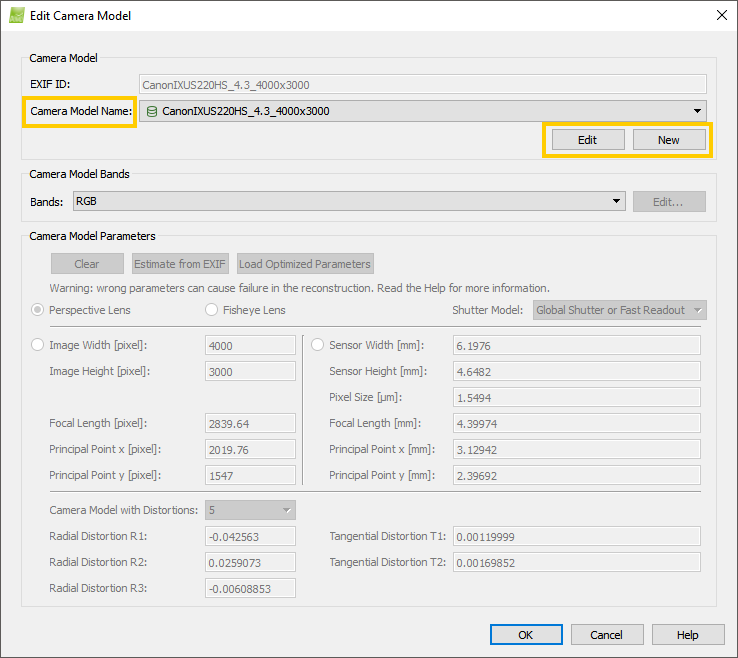 If the internal camera parameters do not match the camera used, edit the camera model following the instructions below. Once a project has been processed and if the quality report displays under the Quality Check section, on Camera Optimization, a relative difference between initial and final focal length that is higher than 5%, change the camera initial values to the optimized values: 202560059. When no project has been processed using this camera model but the values of the camera model differ considerably from the known values. 1. Select the Camera Model to be edited following the instructions above. 2. On the section Camera Model, click Edit. 3. Select the lens type between Perspective Lens or Fisheye Lens. 3. Edit the parameters by changing their values. The parameters can be reset by clicking Clear. If the images have enough information about the camera model in the EXIF data, the parameters can be estimated from the EXIF data by clicking Estimate from EXIF. In order to save the camera model in the camera database, Click Save to DB (the icon will be displayed with the camera model name) and click OK. In order to save the camera model for the project, Click OK (the icon will be displayed with the camera model name). Note: If the radial and tangential distortion parameters for a perspective lens are not known, it is recommended to set them to 0. Image Width [pixel] Image width in pixels. Image Height [pixel] Image height in pixels. Focal Length [pixel] Focal length in pixels (if defined in pixels, the mm value is automatically computed and added to the corresponding field). Principal Point x [pixel] Principal point x coordinate in pixels (if defined in pixels, the mm value is automatically computed and added to the corresponding field). Principal Point y [pixel] Principal point y coordinate in pixels (if defined in pixels, the mm value is automatically computed and added to the corresponding field). Sensor Width [mm] Sensor width in mm. Sensor Height [mm] Sensor height in mm. Pixel Size [μm] Pixel size in μm. Focal Length [mm] Focal length in mm (if defined in mm, the pixel value is automatically computed and added to the corresponding field). Principal Point x [mm] Principal point x coordinate in mm (if defined in mm, the pixel value is automatically computed and added to the corresponding field). Principal Point y [mm] Principal point y coordinate in mm (if defined in mm, the pixel value is automatically computed and added to the corresponding field). Radial Distortion R1 Radial distortion R1 parameter of the lens (optional, it is recommended to leave the distortion parameters to 0). Radial Distortion R2 Radial distortion R2 parameter of the lens (optional, it is recommended to leave the distortion parameters to 0). Radial Distortion R3 Radial distortion R3 parameter of the lens (optional, it is recommended to leave the distortion parameters to 0). Tangential Distortion T1 Tangential distortion T1 parameter of the lens (optional, it is recommended to leave the distortion parameters to 0). Tangential Distortion T2 Tangential distortion T2 parameter of the lens (optional, it is recommended to leave the distortion parameters to 0). Note: For detailed information about the internal Camera Model Parameters: How are the Internal and External Camera Parameters defined?. 1. On the section Camera Model, click New. 2. Select the lens type between Persepective Lens or Fisheye Lens. 3. Edit the parameters by changing their values. The parameters can be reset by clicking Clear. 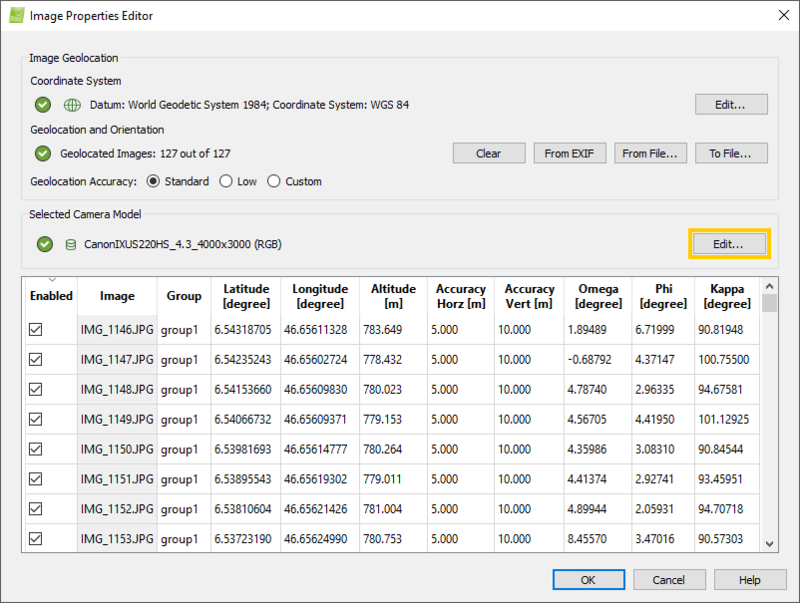 If the images have enough information about the camera model in the EXIF data, the parameters can be estimated from the EXIF data clicking Estimate from EXIF. Focal Length [pixel] Focal length in pixels (if defined in pixels , the mm value is automatically computed and added to the corresponding field). Principal Point x [pixel] Principal point x coordinate in pixels (if defined in pixels , the mm value is automatically computed and added to the corresponding field). Principal Point y [pixel] Principal point y coordinate in pixels (if defined in pixels , the mm value is automatically computed and added to the corresponding field). 2. Select the camera model that needs to be reset. my camera is Zenmuse xt 9mm 640x512. Pix4d recognizes it as FLIr_9.0_720x480. How can I force it to use the Exif ID FLIR_9.0_640x512. I've tried to keep this exif id but change the values in sensor width, pixel size, etc. But the results are off. also the camera model bands are set to RGB and when I try to edit to only have thermal I can't click OK. My results always form a 'banana shape', as Marc puts it, and the data is not aligned with RGB images I take at the same time. Otherwise under Camera Model Parameters >> Estimate from EXIF will populate the internal parameters fields with the values from the EXIF of your imagery. The bands are always read from the EXIF of your images. Most probably you are processing the jpeg imagery and not the r-jpeg or tiff grayscale. The following article may be useful: Processing thermal images. For the rest of the request, please submit a ticket via our request page so that we can further investigate. To fasten the investigation, please include the requested files: p4d file, log file, and quality report. Thank you for your feedback on our article.